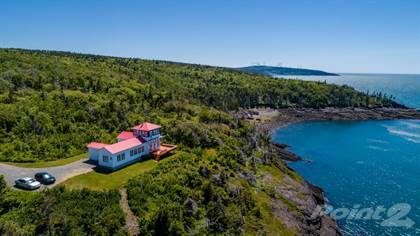 Unique home with bold, deep water ocean front on the Bay of Fundy sitting high on the cliffs, views from this property are breathtaking. Property is a short drive to the town of Digby yet is very private and secluded. The property includes approximately 230 acres with approximately 3100 ft of Ocean front. Enjoy spectacular sunsets over the water, walk along the rock shelf down to the water, where you can get close enough to develop a friendship with the seals. On a lucky day you can observe whales swimming by. Driveway is gated, tree lined, groomed, with stable base topped with crushed stone and is 1 km long. Walk into the home to find an open concept kitchen, dining and living areas.On the main floor there is a private bedroom with full bath, as well as a den which could serve as an additional bedroom which is adjacent to another full bath. The turret on the second floor which serves as the master bedroom, it is surrounded by glass for panoramic views and the bed is windowsill level, just outside is a metal observation walkway. The main deck features built in benches and nautical hardware. Completely off grid, the state of the art system supports a full range of appliances. Recent upgrades include 6 newer 250 watt solar panels and charge controller which doubled original solar capacity, the original batteries were replaced with Rolls Surrette Batteries, these are still under warranty. A new propane water heater, recently serviced, 2 propane space heaters with new pilot assemblies. Property also includes two outbuildings used to mount the solar panels and to house a commercial grade propane fired back up generator. Properties such as this are a rare find, if you value your privacy this one is for you. Owner intended to eventually use it as a full time residence adding a barn and other outbuildings to complete a salt water farm. Hi, I'd like to find out more information about 2470 Culloden Road. Thanks so much!